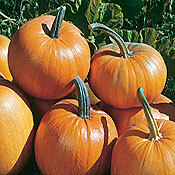 description for "Winter Squash and Pumpkins: Cucurbita pepo, 'Jack-O-Lite'"
Cucurbita pepo 'Jack-O-Lite' has smooth skin that makes for ease in painting come Halloween time. Its compactness produces 8-15 lb fruits. 'Jack-O-Lite' is also excellent for carving and pie baking. Two basic shapes: round to slightly flattened or tall and elongated. Very finely ribbed. Planting depth: .5-1 inch. Days to germination: 5-7 days. 90 days to maturity. reviews for "Winter Squash and Pumpkins: Cucurbita pepo, 'Jack-O-Lite'"